(January 2019) -- When we visited Cape Cod and Martha’s Vineyard several years ago, I witnessed most of that region within the tiny black and white viewfinder of the camcorder. The recorded memories were nice. After the fact, I hadn’t allowed myself to fully enjoy Cape Cod ... in real time. Unaware at the time, I had developed ... photography tunnel vision. Prioritizing is important and this year our Florida vacation took top priority and photography was shifted to second place. Vacation requires planning, making reservations and packing. We started packing the night before our departure. We packed shirts, tops, shorts, sandals, and other essentials. A Canon 7D Mark II, securely paired with a Tamron 70-200mm f/2.8 and Sigma 18-35mm f/1.8 Art lens, was neatly tucked inside my backpack. I took the camera nearly everywhere we went and I took a lot of pictures. My photography mindset was simple ... spot subject / compose / actuate shutter, and move on. We enjoyed our vacation and have fond memories ... and a few pictures to share. We drove to Northern Kentucky and spent the night at a hotel near the airport. The next morning we boarded our early flight to the southern region of Florida. One thing I’ve learned is that life doesn’t come with a script. Our direct flight to Fort Lauderdale International arrived on schedule and the car rental company shuttle was waiting outside the airport. We boarded the shuttle, rode a short distance to the rental office ... checked in ... and departed in our rental car. Not exactly. Checking in at the car rental wasn’t quick and it didn’t go that smoothly. Everything had gone smoothly and had been on schedule up to that point. To our dismay the rental company’s entire computer system was down. We were told someone was working on the problem and hoped to have the system back online by noon— we arrived there at 10:15AM. Their two person staff was courteous and apologetic about our delay. The shuttle driver offered to drive us to another rental company. Other potential customers waited in line as they searched on their cell phones for another rental company. The hands on the wall clock continued in a clockwise rotation and customers started canceling reservations and going elsewhere to rent a car. An hour had passed since we arrived. We suggested that if we waited until noon, the company could upgrade our rental car at no charge. The rental company wasn’t located in an attractive part of town. It was more of a remotely maintained industrial area. We gave the staff our cell phone number and walked down the street to a bar and grill that was open, called Riverside Market South. Several respectable looking folks were seated at the bar, having drinks and enjoying casual conversation, when we walked inside. The place had an eclectic vibe and the atmosphere was pleasant. The weathered wood exterior of the structure was adorned inside with a variety of distilled spirit signs hanging on the walls. An old bicycle, a surf board, and some other items were all suspended from the rafters. A long bar stretched across the front of the L-shaped room and well stocked coolers covered the side and rear wall. Draft and craft beer menus were written on a large chalkboard near the right side of the bar. Adjacent, was the dining area, furnished with older square wooden tables and sturdy wooden chairs. One would be hard pressed to find fault with those house rules! The proprietor was a big burly guy with a dark tan, beach hair and a beard, tattoos down the length of his arms and legs. He brought a couple of menus to our table and took our drink orders. An unusual way to start the day, I ordered a dark stout and my wife ordered a water. After browsing the menu, my wife order the grilled cheese sandwich and I ordered a hamburger with fries. What could go wrong? Our food was served in a reasonable time and prepared exactly as we ordered. Their grilled cheese sandwich was best grilled cheese my wife had ever eaten and my hamburger was delicious. When asked about the secret to their grilled cheese sandwich, the guy said they prepared them the same way his mother made them. An extra step taken while grilling turns an average grilled cheese into exceptional. The car rental office called while we were eating. Their computer system was back online and we could pick up our rental at anytime. The company upgraded us to an SUV at no additional charge and the unexpected delays at the start of our vacation evolved into a fun experience. Our condo in Pompano Beach served as home base for the week and our seventh floor balcony offered a view that overlooked the resort and ocean. We had dinner with a couple from Fort Lauderdale Saturday evening at an upscale restaurant on the water called the Blue Moon. Both the food and service was excellent and par for the price. The next evening we took a short drive south to nearby Lauderdale-by-the-Sea. The small town is part of the Miami/Fort Lauderdale/Pompano Beach Metropolitan. The ocean front area consists of more resorts, a fishing and observation pier near a variety of shops and restaurants. Lauderdale-by-the-Sea is a lively place— a lot of foot traffic and street corner musicians. I would have really liked that area during my younger years. A two dollar per person toll was required to walk out on the fishing and observation pier. Paying the two dollar toll wouldn’t have been bad had the last third of the pier not been closed due to repairs and renovation. We drove to Jupiter, Florida on Sunday and visited the Jupiter Lighthouse. 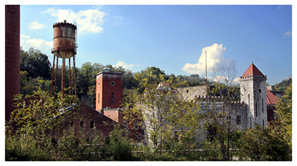 The red painted brick structure set atop a nicely landscaped hillside. Visitors have to walk up thirty four steps to the lighthouse, then another hundred and five winding steps up to the observation deck surrounding the top of the lighthouse. It’s the oldest structure in Palm Beach County. I climbed the narrowing spiral steps with ease and took a few photographs from its observation deck. The view was beautiful, overlooking marinas with the Atlantic ocean in the background. We had an enjoyable day in Jupiter. I could write paragraphs about the Banyan tree near the base of the lighthouse. To simply call it a tree would be an injustice. Banyan trees aren’t native to Florida and this tree has grown into a community. The tree could easily have it’s own zip code. I won’t explain the uniqueness of Banyans, I suggest you search the species on the Internet and learn more about them. Monday’s destination involved hotel accommodations reserved in Key West. We set our alarms for 5AM with the intention to leave Pompano Beach no later than 6AM. We departed Pompano Beach shortly after 6:30AM. Leaving thirty minutes later than planned wasn’t bad considering we were on vacation and not punching a time clock. How many times have you seen the words time clock and vacation used in the same sentence? As we pulled out of the parking lot, the sun was slowly rising above the horizon. Destination bound, we were finally on our way to the Florida Keys! Everyone should drive to Key West at least once if possible. A two lane blacktop road brought us into the upper Keys and evoked a sense of nostalgia, having heard references to the Florida Keys many times. Traveling south through the Keys made an impression on me. In a geographical sense, the calm open waters were something I’d never experienced before. The water’s color varied at times, often within the same region. There’s a remarkable contrast between water, islands, and sky. Seeing the Key Largo sign was exciting. It signaled to us that we had truly arrived at the Keys. We drove across forty-two bridges on our way to Key West, including the renowned “Seven Mile” bridge. The original seven mile bridge is visible from the newer bridge and much of the original structure was rusted, deteriorated with age. The weathered old bridge would be an interesting icon to photograph, best accomplished by boat, instead of from from the road. Whether you’re driving, or walking on foot, Key West is an interesting place. We’d been downtown only minutes before I heard the crow of a rooster. I thought to myself, “That was odd”. I turned toward the sound and a few feet away from me stood a game rooster. As we continued our walk, the abundance of chickens and roosters, was the first thing I noticed about Key West. Since all birds on Key West are protected, the poultry species of two-legged fowls are plentiful, freely wandering the region. The sound of a roosters’ crow was heard throughout the day. Some people consider it annoying, as a visitor I found their boastful salutations to be humorous. Key West loves their roosters. Several of the buses and trollies on the island had metal sculptures of a rooster mounted outside the vehicle above the front or rear windows. Key West epitomizes the concept of “free range” chickens ... and, roosters. Walking the narrow streets of the old town, in most any direction we looked, there was poultry in motion. I strongly recommend the tour of Ernest Hemingway’s home. We spent an hour or so walking the grounds and the guided tour was very informative. The Hemingway property encompasses an entire city block of Key West. I imagined Hemingway walking or sitting amongst the vast foliage that towered over the property. Behind the main two-story residence was another two-story structure. The top floor was Hemingway’s writing room. The large space had three book shelves, a sitting area, and a small table fitted with a typewriter. More than forty well cared for cats live on the Hemingway property. Nearly all of them were direct descendants of Hemingway’s original six toed cats. The assortment of four-paws-six-toed cats had a variety of colors and patterns. The cats freely wander through the house and throughout the property outdoors. It was rare to see two or more cats lounging in the same room or within the same area of the property. The cats have an acre of property to call home so they’re usually scattered about in different places. We spotted one of two lying near the pool and noticed another ball of fur curled upside down, asleep on a love seat. Two cats were contently lying atop a soft quilt on a bed upstairs. After our first day of exploring Key West we thought it appropriate to have dinner at Jimmy Buffett’s Margaritaville restaurant on Duval Street. Our waitress was friendly and attentive. Our entrees were several notches above average— they were delicious! Early Tuesday morning I crossed the street from our motel to watch the sunrise. There are no waves around the Keys— the surrounding water isn’t deep and the mass of coral reefs doesn’t allow any waves to form. The morning sun’s rays gleamed across the flat rippled surface of the Florida Straits … another reason to put the Florida Keys on your bucket list. We didn’t spent any time downtown late at night although I’ve heard the town has a different vibe in the later hours. On our last day in Key West we enjoyed a late afternoon lunch at the Blue McCaw Bar and Grill. It’s a large outdoor sitting venue with live music. The outdoor decor captured the essence of the tropical island— in other words, laid back and casual. We rode a trolley back to our motel and departed Key West around five o’clock that evening. Traffic wasn’t nearly as bad on our return trip to mainland Florida. We stopped at the Island Seafood Company in Key Largo for dinner. The food was excellent and service and staff were friendly. The large restaurant had covered outdoor seating next to the water, adjacent to their small marina. The atmosphere was inviting and the restaurant was packed. I appeared to be a favorite restaurant for both locals and for tourists. The restaurant was very accommodating and easily accessible by boat, vehicle, jet ski, or helicopter. A well marked landing pad was located at the end of their shotgun parking lot. We spent our last day in Florida in the city of Delray. We drove to the Wakodahatchee and Green Cay Wetlands. Cooler temperatures and a mild breeze had set in and provided a near perfect afternoon to enjoy explore the sights and the sunlight. The two wetland areas in Delray are only a few miles apart and I’d recommend visiting both areas. The parks close just before dusk and are free to the public. Slightly elevated boardwalks weave their way through marshes and land, some days the visible wildlife is plentiful. A variety of herons, cranes, ducks, and other fowls populate the area. Most days you’ll also see small and large iguanas and other lizards throughout the wetlands. On the day we visited, alligators were more difficult to spot— we saw two. My best advice would be to pay close attention to where water meets land and also watch for alligators lying beneath trees. We met several people during our walk through the wetlands, most everyone had a different memory to share about the area. Suffice to say, it’d be rare for any two visits to be the same. A different day, or a different time of day, would offer visitors a different experience. Life doesn’t come with a script. (November 2018) -- Things I've learned as an adult. Firemen, Republicans, policemen, sanitation workers, lawyers, riverboat pilots, Baptists, doctors, Jews, pharmacists, olive skinned people, red skinned people, dark skinned people, light skinned people, artists, Catholics, teachers, professors, farmers, Episcopalians, administrators, Christians, non-Christians, politicians, opticians, musicians, students, window washers, electricians, Muslims, mechanics, Democrats, hairdressers, pilots, Buddhists, bus drivers, Uber drivers, managers, preachers, Libertarians, engineers, photographers, etc., are all ... people. Plenty of good people inhabit the planet— some bad people also roam this sphere we call Earth. Some people sort and scrutinize others based purely on their own beliefs. These people tend to assign labels to others. Others believe labels only serve to place people into groups, removing individual persons from the equation. Everyone has opinions. People like to express their opinions. Most people like feeling they're correct. Some people like to argue— others, prefer civil discussion. A lot of people enjoy posting memes on social networks. Some folks enjoy the "in your face" meme approach. Some folks think more deeply than the "in your face" approach. Some people behave on social networks in a civil manner— some people do not. There are folks that believe their opinions are the only opinions that matter. There are others that prefer intelligent discussion of both sides of an issue. Some folks believe everyone has a right to eat and breath— some folks are undecided, based on another individual's belief system. Social media could be a learning experience for many people. Social media is a learning for experience for some. (September 25, 2016) -- A photographer acquaintance from Wales arrived in the states for a nine day visit. I suggested we meet when I discovered he'd be staying in Lexington, Kentucky. Via e-mail we selected a day and place to meet. My wife and I met Pete downtown at a nice casual restaurant called Pies & Pints. After introductions, conversation ranged from common interests and events of the day to exchanging laughs -- dialog never lagged. we left the restaurant feeling like old friends and expressed a desire to stay in touch. We conversed through e-mail the next day and coordinated a malleable photography excursion for the following day. Not keen on shooting in the high noon sun, we left Lexington around 2:30 in the afternoon. With our camera gear loaded in the Jeep, we hit the road with only two destinations in mind. We left Lexington with the understanding that if anything caught our attention while traveling to and from Bagdad ... we'd consider it a bonus. We took US60 out of Lexington and turned onto Elm Street in Versailles. We followed that road on through to McCracken Pike. A group of people driving Polaris Slingshots passed us before we reached Woodford Reserve Distillery. There must have been six or seven of the three-wheeled vehicles in the group -- wind blowing through their hair as they cruised the country back roads. The exotic open air vehicles have been good sellers in this region of the country, starting out at $25,000. Most of the Slingshots that passed us that day were high end models. It's the unexpected moments that make driving back roads so much fun. When you happen upon the unexpected in a positive way it provides motivation -- having a flexible itinerary can be important. Never underestimate the power of spontaneity ... it served us well throughout the day. As we continued down the winding road, a few miles past Woodford Reserve, we came upon a deteriorated two story structure next to the side of the road -- our first stop of the day. I parked the Jeep at the side of the road, we grabbed our cameras and began exploring the intriguing structure. A large area of the roof had collapsed -- gone. The middle portion of the aging structure open to the elements without a separating floor. 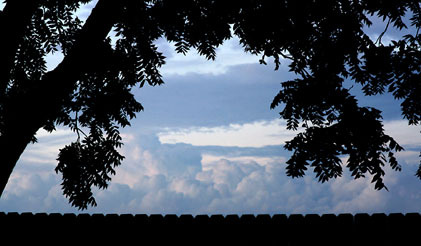 As we walked toward the building a few second story windows framed sky and clouds. Unattended plant growth had sought paths of no resistance and had crept through openings in the brick structure -- vines and other vegetation now cling to interior walls. Dark abandoned stairwells stretched upward through narrow corridors to the surrounding second floor. Directly across the road were other structures to be noticed -- quietly waiting for someone with a camera to take their portrait ... we obliged as we walked around the area and later strolled a short stretch of the narrow two lane road. We stayed in the Millville area for an hour or so before driving further down McCracken Pike. We traveled a few more miles of winding road before we turned onto to 1005. We drove on that stretch of road, past the small town of Hatton, and soon arrived at the last stop on our itinerary -- the town of Bagdad, Kentucky. We spent about thirty minutes photographing the Bagdad Mill Works and its surrounding silo structures, then stopped at a nearby store to buy road worthy snacks and refresh ourselves with bottled hydration. When we stepping inside The Corner Keystop we were treated to another high point during our road trip. The medium sized independent market / hardware / restaurant / gas station / book store is located on a curve in the road. Their generous parking lot provided easy access and the store has genuine curb appeal -- large brand specific metal signs are posted nearly the entire length of the building. 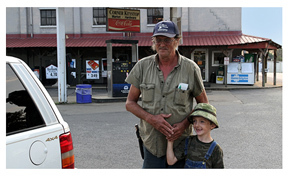 The folks we encountered in the small community of Bagdad, Kentucky were some of the friendliest people we'd ever met. Our pause for refreshment provided us with snacks and hydration and a sense of encouragement for humanity. When we stepped outside and walked toward the Jeep a local farmer walked over and asked Pete, "In the store, did I hear you say you're visiting from Wales?" The seasoned farmer smiled and extended his open hand, "It is a pleasure to meet you." He then shared with us the connection he had to the United Kingdom through his work with the state of Kentucky and Department of Agriculture. He also mentioned a subscription to a farming publication that he and others subscribe to from around the world -- they'd often take a picture of someone holding the magazine before mailing it to the next subscriber. The farmer gave us permission to take a couple of pictures of him with his small grandson, attentively standing next to him in overalls. The young boy had never interrupted us during conversation -- when we raised our cameras to snap a picture of him next to his grandpa, a smile that could stretch across the globe covered the little boy's face. Impromptu moments continued -- my wife called during our return trip to Lexington and said Pete and I were invited to her dad and step-mother's house for a chili dinner. We took them up on their offer -- more stories were shared and more friends were made that evening. It had been a rewarding day on many levels. (February 17, 2016) PREFACE - I drove to Jacobson Park one morning to photograph a piano I had heard about. It seemed like an ideal subject to feature in my "Off The Cuff" photography series. On that morning I didn't know a friend of mine was involved in what has become a topic of mystery and intrigue amongst local photographers. A week later the piano was featured in a local news story. Days later lines began to form at the site where the piano sat in the mature pine grove. People photographed the piano with their cell phones, SLRs and point & shoots cameras. Selfies and portraits were taken next to [and on] the piano. Carefully composed scenic shots were taken. People began bringing props to add an original flair to their images. The inanimate object had become a local celebrity. A few days after I had photographed the piano photographer David H. McRae explained how the piano got there. McRae, musician Greg Finger and his wife, and a male friend had met at Jacobson Park one afternoon in January. The piano was delivered to the city park in pickup truck. McRae and the other two males unloaded the 850 pound piano from the truck at the exact spot it has set for over a month now. They joked amongst themselves at the time about just leaving the piano there. It didn't take long for inclement weather to arrive and delay removal of the piano. BLOG - After seeing a couple shots of the piano on Facebook a couple of weeks earlier, I decided to drive out to Jacobson Park and photograph the mystery piano that was sitting in a large pine tree grove. I considered the lone piano as art - an unusual element sitting beneath the large canopy of pine trees. During the past few weeks the piano has become a conversation piece due to more people spotting it in the park. The first morning I visited the piano a fairly dense fog hovered through the park. I parked close the grove near the edge of the paved roadway - walked several feet back looking for a place I could cross a shallow ditch without wading through standing water. Remnants from a recent snowfall covered the ground and portions of the upright piano. The setting was surreal - a photographers' dream. Dressed in blue jeans, an insulated shirt and a warm jacket, I endured the cold temperature fairly well - my extremities were the only parts that posed a problem. After several minutes in the cold air with a camera my hands became extremely cold. I had left my warm gloves in the car since operating camera controls is nearly impossible wearing winter gloves. Crisp manual focusing became a challenge as my hands got colder. I walked back to the car two times that morning to warm my hands. Since that morning I've researched specialty gloves made for cold weather photography. Several brands are available that feature fold-back finger tip and thumb covers. On the second morning I arrived at the park to document the piano, I met three people walking in the pine grove with their dogs. There were five dogs walking in the pack, each one a different breed, size and color. Observing from a distance it became obvious the dogs were well kept, good temperament, social canines. The dogs were unleashed, yet they never wandered far from their owners. Most impressive, the owners also picked up after their well disciplined pack. I enjoyed witnessing their morning trek through the pines as I photographed the piano. The fog wasn't as dense that morning so expectations of what I might capture changed a bit. My number one objective was to simply document the piano ... sitting amongst the pines. Art. Quietly posed. Without fanfare. For anyone to experience. It grabbed me as a spectator. After photographing the piano I returned to my car and drove toward the other end of the pine grove. I parked near two vehicles that might have belonged to the three dog walkers. They were nearby at that moment so I asked if I could meet them. A friendly reply came in the form of, "Come on up and join us!" The trio of one woman and two men were pleasant folks. As I walked the incline toward them, their dogs started running toward me. I didn't have a chance! I was out numbered - five dogs against one of me. The dogs circled around me sniffing, the border collie jumped up on me. I started talking to the dogs and loved on them. After a couple of minutes the dogs began to spread out and wander around closer to their owners. All of them except for the small black curly haired one. It continued to stand near my feet and never moved. The dog never raised his head. He just stood there staring at my lower legs. The other dogs had walked away. Not the short black curly haired dog. He stood there without movement. Stretching my arms outward and upward, I looked toward the dog owners ... laughing, I asked, "What does he want?" The woman immediately replied, "He wants you to throw his ball!" When I lean closer to the little dog, sure enough, he was holding a tennis ball in his mouth. I gingerly took the ball from his mouth and tossed through the woods. The small black curly haired dog retrieve it and carried it back to me, dropping the tennis ball at my feet. The two of us repeated the maneuver three more times. Watching the two of us from a distance, the trio of walkers said, "You're welcome to walk with us!" I walked with them for a few minutes. My hands, frigid at that point, still carrying a camera. Conversing with my new found friends was fun. One of the gentleman mentioned that a mysterious man occasionally plays the piano during the night. I replied, "Is that right?" I was about to suggest that the mystery man's image would not appear on film when the man laughed and said, "Not really!" We shared more than a few laughs during our brief encounter. It was an enjoyable morning that would never have happened had Greg Finger and his promotion crew not left that piano sitting in the pine grove at Jacobson Park. Another photographer friend mentioned the piano at Jacobson Park on Facebook yesterday. He had stumbled onto it two days ago and shared the fact it was sitting there with other photography friends. It was later that evening when pieces of the puzzle fell into place and I discovered a friend of mine and the Greg Finger Band were the reason behind the mystery. Chapter 1 - A friend of mine moved back to Kentucky from Colorado in the fall of 2011. Both of us, photography enthusiasts, met for lunch at Cheddars one afternoon to catch up on current events and converse about his recent quest to the west. Conversation included the vastness of the great outdoors, landscapes of the west and southwest, cameras, lenses, even personal ambitions. Perhaps it was an offshoot of those conversations that started us on a series of photography treks in March 2012. We would load our camera gear into the back of the Jeep and decide on an approximate destination for a photography road trip. We never sought exotic locations or necessarily looked for neat and tidy spots. The expressed goal was simple - find the shot in places that were often unfamiliar to both us and our cameras. We went to urban and secluded spots in and around Lexington, Kentucky. Occasionally we ventured to other towns. It's both a challenge and fun to capture scenes slightly off the beaten path. Perhaps the neatest upside to doing a project like this is the learning experiences. Our first photography excursion led us to a remote section of railroad tracks. The rails lay between an old warehouse and an old closed tobacco factory just off Main Street, with a stretch of double tracks that includes a switching turnstile. That first shoot resulted in a number of interesting images. One of my favorites is of a patch of overgrown grass next to a weathered downspout which happens to be the cover photo for this gallery. On another trek we spent our time wandering around downtown Lexington, Kentucky. While snapping shots around the perimeter of a historic downtown church we saw a woman walking down the sidewalk carrying a brown folder that held a number of rather large prints. Wind gusts were strong that day and after the woman had passed where we were standing, a gust of wind carried one of the prints out of the folder. Unaware that the wind had lifted the print, the woman continued walking. The large print landed face up on a section of sidewalk about thirty feet behind her. Nathan and I were about a block away when we saw the print sailing through the air. The woman was nowhere to be found when we reached where the wind blown print laid. She must have gotten into a parked car on a side street. A copy company business card was attached to the print. I recognized the name of the company and knew that they had a location downtown so we walked back to the Jeep and delivered the print to their downtown location. The large print was a professional looking portrait of an older gentleman. When I carried the full color print into the store, one of their employees recognized the image. The employee had made the print only thirty minutes earlier for the woman we saw walking. The company had the woman's phone number on file and contacted her about the lost print. Our excursions have taken us over stretches of country roads that were previously unknown to us. We visited two covered bridges, one of the bridges is still open to vehicle traffic today. There's something about a bridge that was both engineered and built with all wood components that captures the human eye. The span of a covered bridge across a water source adds a certain element of warmth to the surrounding landscape. After a couple of photography trips, I unofficially dubbed these spontaneous excursions as "Off The Cuff" photography. The quality of images in the gallery will vary - most images are taken with a DSLR camera. Occasionally images are captured with a small point and shoot or with a cell phone camera. 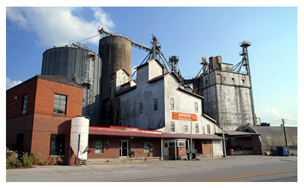 Thus far, images featured in the OTC gallery feature scenes from Kentucky, Indiana and Missouri. Chapter 2 - Over the course of a year we had explored several areas around Lexington, Kentucky and places in nearby towns. Most of our excursions turned into day trips that included lunch and supper. We went to Frankfort, Kentucky a couple of times. One time we spent more time walking around talking and observing our surroundings than we did taking pictures. One trip we stopped for lunch at a little independent pizzeria near the railroad tracks - the local venue provided friendly service and excellent pizza. There's something about downtown Frankfort next to or within blocks of the railroad tracks. The area resonates with a vibe that tends to induce a sense of calm. One afternoon we found a neat place at the top of a hill that overlooks downtown Frankfort called Leslie Morris Park at Fort Hill. This remarkable acreage is packed with Civil War history and fascinating terrain. Once again we spent more time walking, talking, reading and observing than we did framing a shot through our lenses. Wooded areas at Fort Hill are embellished with large thorn trees that were used as organic barbed wire during the war. Fort Hill was never compromised or overtaken by an enemy in the heyday of conflict due to the cunning use of their surroundings. Soldiers hunkered down amongst rolling terrain and tactical fortification that secured the entire perimeter of the hill. Cemeteries are neat places to visit with a camera. Especially older ones where time and modern development have secluded their location. Newer and bigger roads have gently nudged their frequent visitors away. Other times such seclusion is a more natural process when generations of families have migrated to other parts of the country. I have taken photographs at Lexington Cemetery [and Botanical Gardens] and at a couple of lesser known cemeteries. One time we stopped at a cemetery located behind a country church on a back road between Lexington and Versailles. The stone and brick church has been well maintained through the years which indicates the structure is frequented by a faithful congregation. There are many grave markers in the cemetery that date back to the eighteen hundreds. I noticed a few markers engraved with 1812 as the year of death. I stood there pondering how many had died of natural causes and also wondered whether some of them had been fatalities of the 32 month long War of 1812. There are always a few surprises. While exploring a cemetery in Frankfort, we wandered upon the grave site of frontiersman Daniel Boone. It's common knowledge that Boone was responsible for a respectable portion of frontier history throughout regions in and around Kentucky. Until that day I had never thought about where the man was buried. It was neat to unexpectedly be standing next to his tall and yet unpretentious monument. I suppose it is only appropriate to mention there is a grave site in Marthasville, Missouri that also claims to be that of Daniel Boone. I find it rather difficult to believe that Boone's body is buried in both states. I suppose it's possible that his body could have been moved at some point in history ... life's little mysteries. Cemetery are usually the final resting place of our human vessels. They provide a place to pay respect to cherished family members and friends. I have never understood the concept of building a monument at the spot where someone has died or was killed. The assembly of a visual salutation to the dead zone remains a mystery to me. I can sort of understand pounding a simple white cross into the ground along side the roadway as a reminder that someone lost their life in an auto accident at that very spot. Be alert and drive Safely. Aside from a simple visual reminder, the embellishment of roadside monuments exhibited at the kill zone seems a bit morbid to me. No disrespectful toward persons that relish roadside monuments - everyone grieves in their own way. I prefer to remember a person's life rather than the spot of their demise. Having said that, I respectfully yield to the varied opinions of others. I've returned a couple of times after a photography trip with only a few images digitally engraved onto my camera's memory card. Perhaps the planets weren't properly aligned on those days. Perhaps there just wasn't anything that caught my eye. Whatever the reason there will be days when nothing clicks. Literally. Pun intended. We've always made the best of circumstances on those less than artistic occasions when nothing clicked and enjoy the ongoing pursuit of the next unusual photo-op. My track record for successful image captures have been fairly balanced between planned and unplanned destinations. It's important to make time for the things you're passionate about. Multiple interests help bring balance to your life - remember the old adage, "All work and no play ..."
Chapter 3 - A day at Raven Run. Batteries not included. Three weeks of planning, coordinating three people, juggling work schedules and determining departure times is no guarantee of a completely successful trip. That statement isn't entirely accurate with the inclusion of one noteworthy error. Proper planning usually includes the removal of a recently charged lithium battery from the charging cradle ... before leaving on a photography trip. Batteries? I don't need no stinkin' batteries! The morning excursion began on schedule. Our agreed upon time of departure was observed by everyone and the sun was rising without a glitch. Everything was moving along as planned. Nathan lived only a mile and a half away and arrived at my house right on schedule. We exchanged greetings and started loading our hiking gear and cameras into the back of the PT Cruiser. We then loaded ourselves into the vehicle and drove across town to pick up Tim. Nathan and Tim had never met before. Tim and I are originally from the same small town in Indiana. We've known one another for over forty years - it had been three years since our last visit. We took the scenic route from Tim's house toward Raven Run - a two lane winding road. Names and introductions were exchanged on the way to our destination. Conversation was plentiful - three friends anticipating a fun day of hiking and photography and sharing past experiences. Tim is an avid cyclist and considers century rides (100 miles) on a bicycle standard fare. He shared a few riding incidents that were seasoned with humor and offered some calculated formulas that help with endurance. It was near the end of May and the temperature was soaring toward the mid nineties. On such a clear day the sun was beaming down on us in all its glory as it warmed the soil below our feet. By mid morning it was hot and it was humid. Neither of those factors dampen our spirits. We were ready for whatever the day had in store for us. Everyone had packed their gear in backpacks. Two of us were loaded with cameras, batteries, lenses, bottled water and even hydration packs. Energy bars and the all important peanut butter and cheese cracker snacks were also tucked away with our gear. Our enthusiasm was at a high point. To make a rather long story shorter ... yes, we had backup cameras with batteries! "Elements of Photography - Seeing Beyond the Lens"